Supervisor dashboard streamlines labor management tasks. Supervisors can access system areas for rapid time card approval and scheduling. The dashboard is designed as your daily action list. It flags the conditions that need your attention, and helps you address them with a single click. The Supervisor Dashboard identifies the time card exceptions that you need to address: one click and you can fix all of them. It also identifies absences and helps you reschedule employees for appropriate coverage. Dynamic time cards capture employee time and allow you to easily correct errors. Scheduling can be done from the time card on the fly, or you can schedule months in advance. Online management reports are easy to customize so you get just the reports you need. 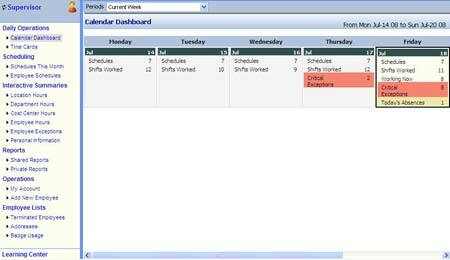 Optional Leave Management lets you address employee requests for time off quickly. All the information you need to make a decision is at your fingertips. See how the Affordable Care Act impacts employers and how Attendance on Demand can help. Smart and adaptive App notifies employees when to add a punch, approve their time card, and more. Intuitive touch screen encourages employee communication and accountability for their time.